Just wanted to throw a quick update blog post. So first off I'm I just want to say WOOHOO!!! I won a giveaway!! I was super surprised when I saw my name on that rafflecopter. The giveaway was hosted by Sally Sayz and here are the stuff I won!! "It's just a bunch of samples!!" Yeah yeah I know but they're the good kind of samples. Gots some Holika Holika, Etude House, SkinFood, Face Shop, Tony Moly and a bunch of other korean brands. I think the one I really want to try is the TonyMoly Tomatox sample. When I first saw I think Shane do a review on this on youtube it made me really want to try it! So now I can with this little sample, YES! That red polka dot is actually a makeup bag, which is super cute! And as you can see, all the actual stuff I won. 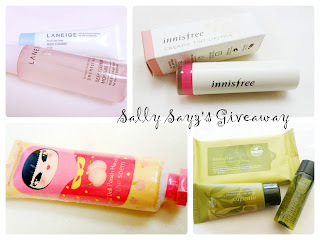 Mostly Innisfree products. I've never heard of the brand Innisfree before so I can't wait to try them out. I did try the innisfree lipstick and omigaaaaaaw I love the color!! I'll do a review on it on another post though. As for the other stuff I got some bottles of Laneige face stuff, an Etude House lip tint, hand cream and a nose pack!! And that's it for the post. Go check out Sally Sayz blog!! And I'll see ya in the next post!! !